A well-stocked bar should satisfy most guests’ flavor preferences. You should plan to serve at least one brand of Scotch, whisky (Canadian and Irish would be ideal! ), vodka, gin, rum, and tequila. In the wine category, have a dry white and red on hand as well as a sherry. It is common today for people to consume a wine or sherry instead of the traditional “cocktail.” Cordials have become popular as well and should be considered on your buying list. It is always a cordial gesture to ask your guest if they would like a drink and then mix or pour their preference. Never insist. We would also recommend that you ask them to help themselves to refills; a good host or hostess always exercises moderation toward guests. Traffic jams can be avoided by locating the bar away from the hors d’oeuvres serving area and kitchen (as the latter is usually the food preparation and clean-up area). Line up your supplies beforehand and mixing will be a lot simpler…and a lot faster too. 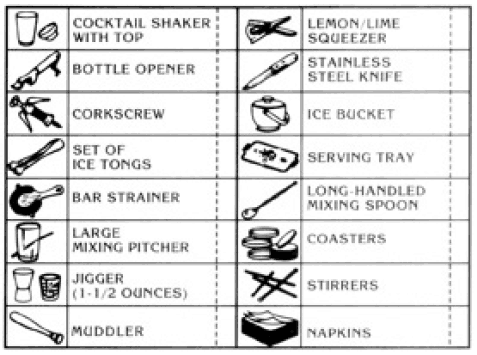 Always use a jigger to measure your liquor or pour directly from the premixed cocktail bottle. Too much liquor spoils a good drink – and a good party! Carbonated drinks should never be stirred vigorously. This releases the gas and makes the drink go flat quicker. Always hold the soda bottle at an angle when opening. This preserves the sparkle and minimizes foaming over. When sugar is called for in a drink, use granulated sugar. When adding an olive to a drink, always pierce it with a toothpick and use maraschino cherries with stems. Your guests will appreciate the extra convenience. A melted ice cube makes 2 to 2.5 ounces of water. Never re-use cubes. They can spoil your next drink. Use hard frozen ice. Rub the lip of your bottle with waxed paper before pouring. This prevents dripping. Premixed drinks (with the liquor already added) lend convenience to any party (at home or away). To “frost” a cocktail glass, rub the rim of the glass with a wedge of lemon, then granulated sugar. Pour cocktail to just below the sugar line. If the recipe says shake… don’t stir. If is says stir…don’t shake. One fifth of liquor will make about 17 – 1.5 ounce drinks; a quart about 21 drinks; a bottle of table wine contains about five to six servings. Remember, moderation should be the keynote; you wouldn’t want your guests not to enjoy your home and carefully-prepared food. The following is merely a guide. There’s no need to be socially embarrassed should you decide to eliminate or reduce some of the liquid spirits offered.